After nearly 70 years of proudly serving the Sioux City, Iowa community, the torch has been passed from one distinguished automotive family to another. Vern Eide Motorcars has taken ownership of Condon Honda, rebranding the Honda dealership at Singing Hills Boulevard and South Lakeport Street as Vern Eide Honda Sioux City. With a well-established Honda store of our own, we look forward to living up to the Condon name, while also introducing Northwest Iowa and Northeastern Nebraska to the Eide Effect. What is the Eide Effect, you might ask? It is a company-wide philosophy of treating our customers, employees, and community as we ourselves would want to be treated. The Eide Effect is always on full display at each of our Vern Eide Motorcars dealerships ? from the sales staff to our service department. You know that the little things count. You care about the greater good. You hire and employ integrity. You act like you're being watched. You find the white when others see gray. You mess up, you fess up. From our experienced sales staff and knowledgeable service technicians to our easy auto financing and great lease deals, Vern Eide Honda Sioux City is ready to help! Searching for a clean, dependable vehicle in Northwest Iowa? We are your friendly, trustworthy Honda dealer in Sioux City, IA. 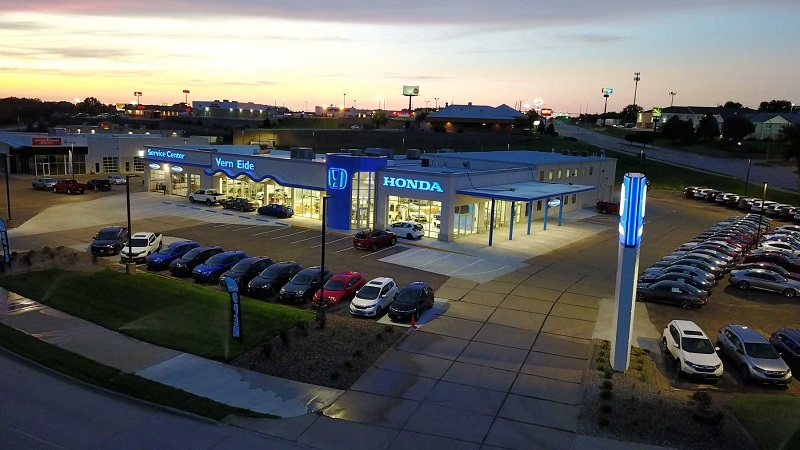 Not only does Vern Eide Honda Sioux City have a great selection of new vehicles and Honda Certified Pre-Owned vehicles, we are also your best resource when it comes to shopping for used cars in Sioux City. We carry most makes and models that vary by year, mileage, and body style. If you're in the market for a used car, simply follow one of the links below to get started! For unexpected car repairs or regular vehicle maintenance, use our online form to schedule your next auto repair with our certified technicians. You can even request Honda car parts online, all from the convenience of your home computer or mobile device. Here at Vern Eide Honda Sioux City, we want your car buying experience to be as positive and hassle-free as possible. If you need financing options, we'll help you find a car loan that works for you! Even if you have bad credit, or are a first-time car buyer, you can trust that your local Sioux City Honda Dealer will professionally fit you into the automobile of your choice. We encourage you to frequent our online car dealership for current Honda lease offers and finance specials ? not to mention clearance events and service specials. Vern Eide Honda Sioux City is proud to serve Northwest Iowa, Northeastern Nebraska, and everywhere in between. Please contact us if you have any questions or comments. We'd love to hear from you!